The stunning wooden bike from Atelier Kinopio juxtaposed with a lineup of more traditional builds entered in the Campagnolo Build contest held for bikes made using components from the legendary Italian maker. Feature | There are two ways to do things. You can make something new or you can stick with what is known and do it at a higher level than anyone else. 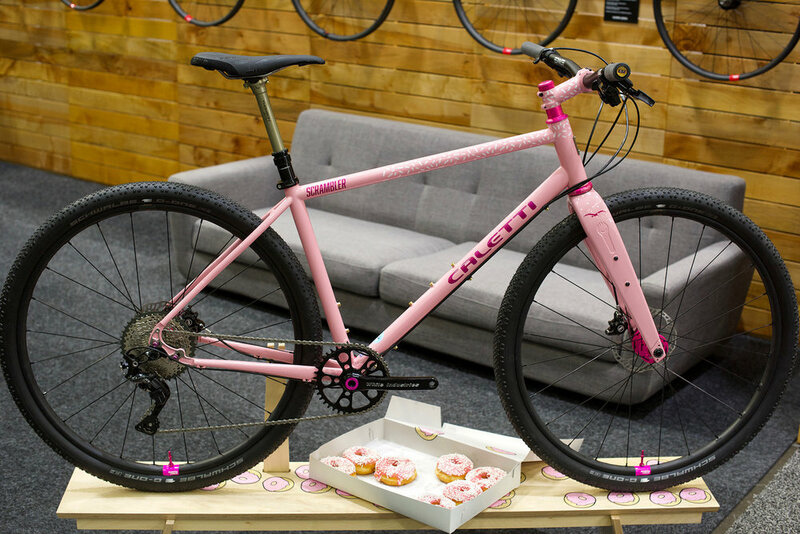 Both of those philosophies were well represented at the North American Handmade Bicycle Show, known to the cycling community as NAHBS. 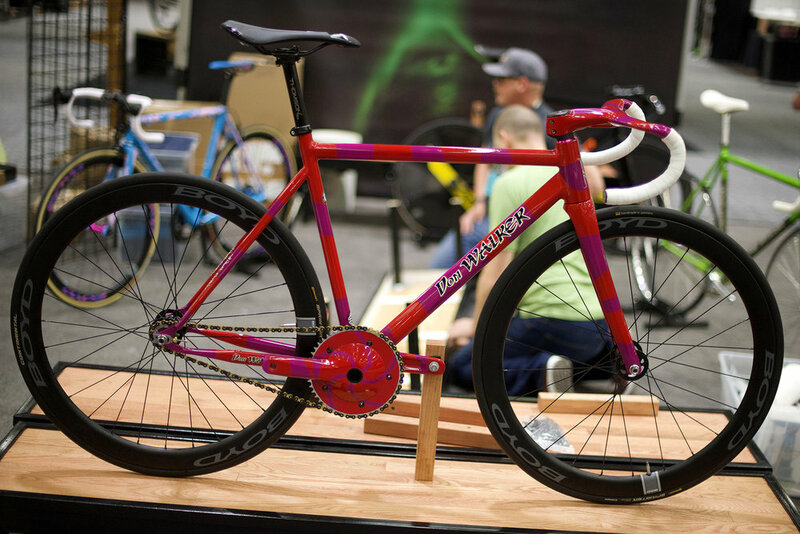 The 15th edition of NAHBS was held, for the third time in its history, at the Sacramento Convention Center over the weekend of March 15-17. The show featured 210 venders and frame builders from all over the world including Australia, Canada, England, Germany, Ireland, Italy, Japan, Russia, Taiwan and the U.S. According to industry statistics, about 40 percent of the American public participates at some level in cycling. For the most dedicated of riders, a custom, hand-made bicycle is an aspirational thing. It’s akin to having the finest car or motorcycle. High-end Danish bearing makers CeramicSpeed partnered with the engineering department at the University of Colorado Boulder to design this carbon fiber shaft drive bike with the goal of reducing friction drag in the drive train. This was one of the more space-age designs at NAHBS. Since the invention of the safety bicycle in 1885 by John Kemp Starley, there has been very little change in the basic layout of the bike. Oh, there are newfangled space-age materials like carbon fiber, but even the most space-age track bike is recognizable as the offspring of Starley. Some of the components of the bike have changed dramatically, but not the bike. Given that, the thing which sets one custom bike apart from another is the details. It’s all in the details, and the details are amazing. The components used, the quality of the welding or lug work, the layout of the frame, the beauty of the finish or paint work are where builders stand out. The clever solutions to the problems posed by two-wheeled human locomotion are what NAHBS celebrates. Frame builder Don Walker is the originator of the North American Hand Made Bicycle Show. Pedal maker and cycle-racing philosopher Richard Bryne made a cogent point. There are three areas involved in going fast on a bicycle: power, resistance and the metaphysical. Power is organic (the rider), resistance is physics (mostly the rider but also the bike) and metaphysical (your mind) is the part where you make yourself do more than you thought you could. 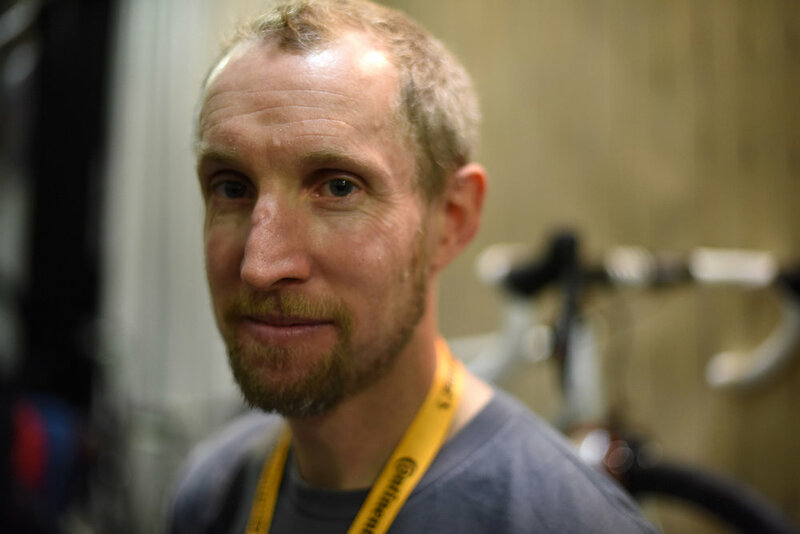 NAHBS is about mechanics and the physics of the sport. Every kind of frame material you might think possible was on display. Every kind of component or bit of gear that might make riding a bike faster, safer or require less effort was on display and for sale. Opposites attract. 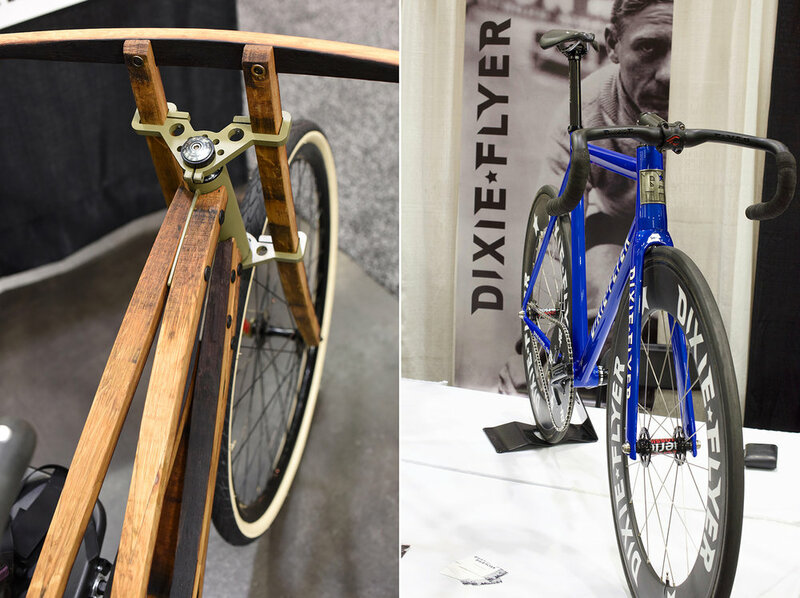 A bike frame made from wine barrel staves contrasts nicely with the Dixie Flyer track bike. In the early days of cycling there were just bicycles. You rode your bike in the street, in the dirt and on the track. Nowadays, much like in the world of motorcycling, there are bicycles designed for use in every conceivable terrain. There are road bikes, mountain bikes, gravel bikes, city bikes, track bikes, comfort bikes, cruiser bikes, downhill bikes, tandems, cross bikes and all the oddball crazy experimental inventions that get made by someone with a vision and a torch. Notably absent from NAHBS were riders and equipment from the BMX world. Seems odd; maybe next year. Many of these sub-categories of bicycle are so similar that it can be hard to tell one from the other for a neophyte. Anytime you have a large number of people in one place, you get to participate in the ever-enjoyable sport of people watching. Cyclists tend to be interesting, stylish people, which makes the watching all the more interesting. Given that several thousand folks checked out the show over the weekend there was plenty to see. 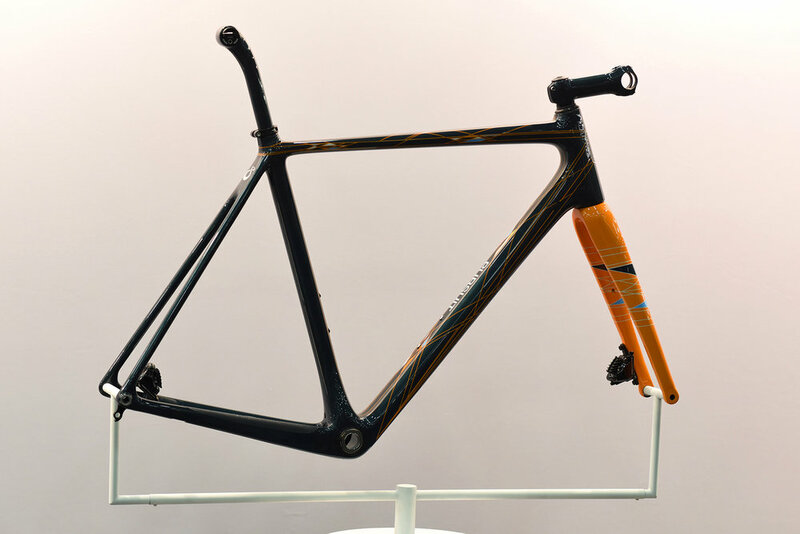 This carbon fiber frame was made by Pursuit Bicycles in Bozeman Montana. Owned by husband and wife team Carl and Loretta Strong, they build about 35 frames to one design a year. Everything is made in house including the molds. The roadies and racers are like greyhounds: slim and serious, slightly aloof. The mountain bikers and downhillers are the punk rockers of the cycling world, ready for some beers and maybe a hit of some of California’s finest. The long distance touring riders are sort of a combination of both. Hipsters and grey beards mingled with Lycra-clad folks who had ridden to the show and clomped around in cleat shoes. There were former Olympic cyclists hanging out, the bike media were in attendance and racers from every cycling discipline were there. There were seminars and talks open to the public every day. Olympic track star Nelson Vails gave some interesting talks, as did a number of frame builders. Steve Wright, the great grandnephew of the Wright brothers, gave an interesting talk on the Wright brothers’ family background and early days as bicycle builders. He also talked about the development of the Wright Flyer. L to R. Frame builder Steve Rex caught in the act of wheeling his gravel bike off for judging. His city bike won best in its class. Mountain bike legend Joe Breeze was hanging out at the Marin Mountain Bike Museum booth visiting with friends and telling stories. The rock stars of NAHBS are the craftsmen who build the bike frames. Oddly, despite the number of women involved in cycling, frame building is an area in which there are not many women involved. A big part of NAHBS is the competition for bike builders. Most of the frame builders submitted a bike for judging in at least one category. In addition to classes for different types of bike there are technical awards for finish, lug work, different types of welding and carbon fiber layup. Frame builder Rob English (English by name and nationality) came from Oregon to fill a large booth with beautiful bikes made in his shop. Brady, a racer and cycling journalist, and his fellow judges, builders Tom Kellogg and Nick Legan, make a preliminary pass through the field and eliminate bikes that they feel are clearly out of contention and then focus in on the standouts. To be clear there are no crappy bikes here. Every bike entered was really nice. The judging is a matter of degree. Brooklynite Tom Porter won the coveted best new builder category with his amazingly detailed townie bike. Best of show was won by frame builders No. 22 Bicycle Company who specialize in titanium frames. Mars Cycles won the People’s Choice award, and the President’s Choice award was a given to Hartley Cycles and Panasonic Cycle technology. Sacramento frame builder Steve Rex won best city bike and was a finalist for best road bike. One of the most fascinating booths at the show was that of the Horton collection. Brett and Shelly Horton have a huge collection of cycle racing photos, posters, postcards and cycling ephemera. They collected it in part to help research and authenticate their world-class collection of racing jerseys dating back to the 19th century. The depth of their collection and their encyclopedic grasp on the subject is just stunning and so visually arresting that it is hard to get away from their booth without spending money. Jan Hein is the editor of the highly respected Bicycle Quarterly magazine. 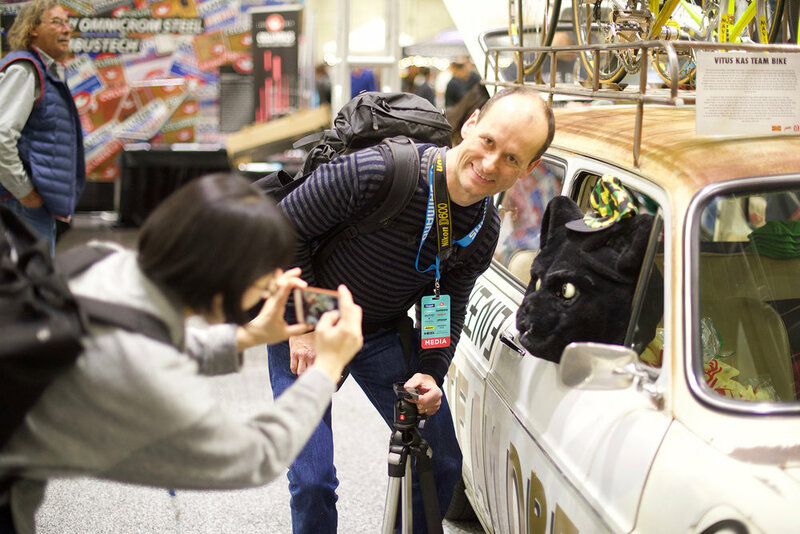 He and photographer Natsuko Hirose came to NAHBS to shoot photos and have some fun with the wildlife. Joe Breeze and Charlie Kelly were hanging out in the Marin Mountain Bike Museum booth. These are a couple of the cats, bike legends both, who invented mountain biking. It’s a purely American invention that has grown into a world-wide phenomenon. These guys are a crackup, and it doesn’t take long for them to start telling some great stories about the early days of the sport. Component builders Paul Components, Chris King and White Industries had great booths displaying a fascinating array of high-quality machined metal. Chris King’s booth had a humorous Tom Sawyer deal going on. Sitting on the counter were pint glasses half filled with components, which, upon assembly by a visitor, earned the volunteer worker the aforementioned pint glass. There were at least two large groups of high school students checking out all the gear and questioning builders. Teacher Jackie Music brought the students from his bike tech program at Cooley Middle School in Roseville California to give the kids a look at possible career choices in the industry. After each night of the show there were parties and rides and dinners where people who see each other infrequently (or frequently) could catch up. Many of the attendees were so pumped up on bikes they had an almost biologic need to ride and blow off steam. I know I said that NAHBS is about bikes but really it’s about community. Cycling is often a solitary experience, and a chance to get together is a fun thing that many riders look forward to.